Note taking apps are dime a dozen these days, but occasionally I stumble across a new one that does something smarter than the rest. 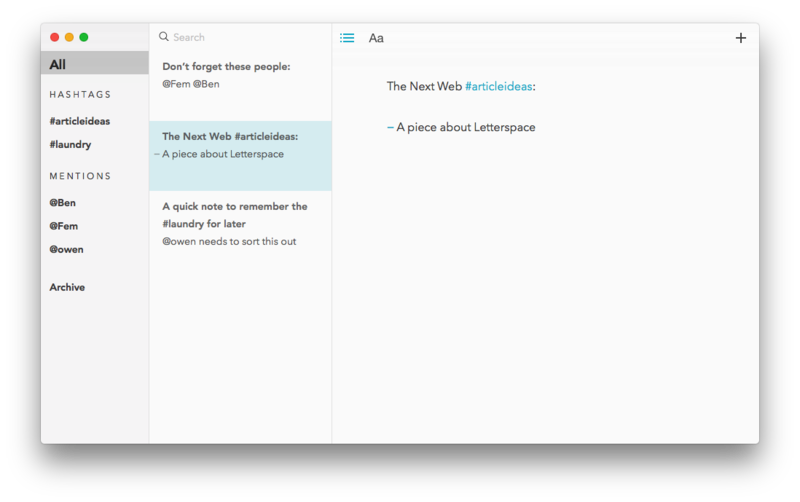 Letterspace, an app for iOS and Mac, is a beautifully designed free app that organizes your notes in an interesting new way we’ve seen on only social media so far: hashtags. With Letterspace, you can hashtag key words inside your notes to help find them easier later, which is an ingenious way of surfacing the important part of a note, rather than requiring you to tag them separately. You’re also able to @mention people in your notes, so that it’s searchable by name in the future. If I needed my partner to do something, I can privately tag her in my notes and then quickly surface notes tagged with her later. I like these ways of surfacing notes much better than the way I’ve been organising them using tools like Evernote (spoiler: not at all). Hashtags in notes seem stupid on first thought, but actually make a lot of sense for easily bringing up what’s important. You’re able to use Markdown to format your notes so there aren’t any formatting tools that get in your way. The app makes it easy to quickly search for notes once you’ve got a lot, with a Spotlight-style search function. The iOS app has an unique feature that allows you to quickly move the text cursor through your notes. Dragging on the blue bar to the left or right quickly scans the cursor in the direction you move, rather than requiring you to tap and hold on the precise place you want to get to. Letterspace also uses iCloud sync so your notes are always up to date on all your devices. The best part about Letterspace is that it’s not only free for Mac, but on iOS too, with small in-app purchases for those that might want to change the color theme.